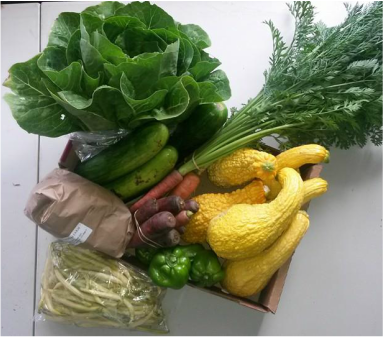 Our vegetable CSA ideally runs for 18 weeks, from May to October with two weeks off during that time. You will still be allocated a full/half dozen eggs during the week off, to be provided the week prior or following, for a total of 20 full/half dozen eggs over the season. ​Community Supported Agriculture (CSA) is a way to buy local, seasonal produce directly from a farmer in your community. You purchase a share of the produce from the farm and each week you will receive a beautiful share of local, fresh, tasty and seasonal produce directly from our farm. A CSA comes with shared commitment and shared risk. When you sign up for our CSA you commit to being our customer for the growing season and we commit to do our absolute best to provide the highest quality fresh, local, organically produced food. We strive for a bountiful share each week but as shareholder you share in the risks as well so some weeks may not be as large as others. Conversely, some weeks may be larger if growing conditions allow. As you can see above, we grow a tremendous variety of produce which cushions us from the impacts of disease, pests, and weather and helps us provide a good mix of products every week. As a CSA shareholder you will also have first chance at any other products we are able to offer throughout the season. Our CSA is only offered as a pre-season buy-in. In return for purchasing a share before the season starts you will receive produce at rate discounted below the market prices. If you are interested in our produce but wish to chose your own or not have to commit please visit us at our Farm Stand or one of the markets we attend. 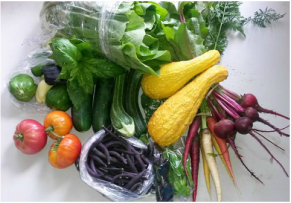 Interested in our CSA? Send us a message.